The Service to call before you call a Builder. Click here to see a 3d animation of this barn/apartment. Frequently, clients come to Karl with very specific and well considered ideas about the design of their new home and barn. Even to the extent that they have already developed very detailed floor plans. That was the case with this design. Since the floor plans were basically done, his job was to refine those plans to account for some structural considerations, add some additional detail, and then project the floor plans into a 3 dimensional design that reflected the tastes and needs of the Owners. The contemporary and minimalistic styling of this design would eventually be complimented by the Owner's selections of furnishings and interior detailing. The outcome was a unique home suited to the exact needs of a couple who's passion for carriage competition messed comfortably with their overall life style preferences. If you have reached that point in life where you know what you want in a new home or barn, and you know it is not out there ready to be purchased, the solution may rest with a custom design. Give Karl a call. If you are planing to build anywhere east of the Mississippi, he is qualified to turn your ideas into that one of a kind residence and equine facility that is just right for you. 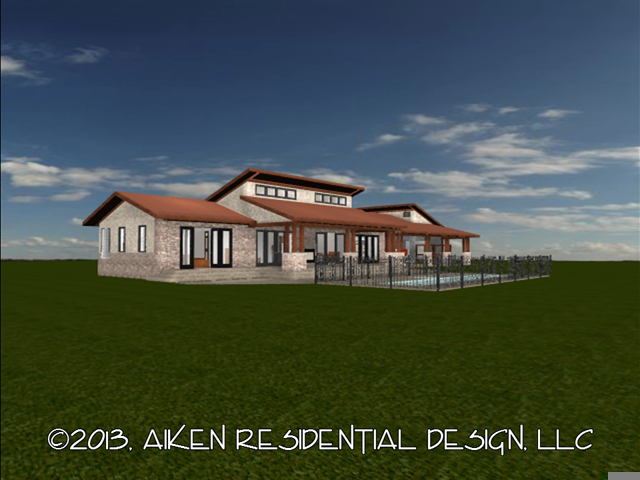 ©2011, Aiken Residential Design, L.L.C.